Start on your path to healthier eating with Spirelli, the spiral slicer that creates noodle-like strips from virtually any firm vegetable. Simply wash a carrot, radish, cucumber, zucchini, or other veggie and Spirelli spirals it into thick or thin strands. Then prepare the vegetables however you choose: unique salads, vegetable stir-fries, and even “zoodles”—zucchini noodles similar to spaghetti. Created by GEFU—a company with 70 years of experience helping anyone become a culinary artist—Spirelli is made with high-quality plastic and Japanese stainless steel blades. It is simple to clean, easy to store, and is dishwasher safe. This convenient spiral slicer will help you create a new array of delicious possibilities. Hi everyone! I'm proud to bring Spirelli to The Grommet. Now you can conjure up endless julienne strips of carrot, radish, cucumber and all kinds of other firm vegetables. I'd be happy to answer any questions you have! This looks like an easy way to maybe get away from pasta noodles. I don't have a lot of hand strength or feeling in my hands. Are these pretty easy to use? 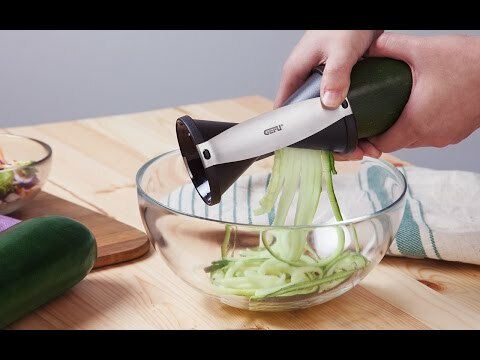 Hello Belinda, the blades are very sharp, zucchini is soft but I am concerned if you say that you don't have feeling in our hand, but I would say go with the larger Spiralfix that has a crank is much easier to turn than the smaller spirelli. @Ronald ..Thanks so much. I am definitely going to order one! It appears a significant portion of the vegetable needs to be inside the device. What happens when you don't have 3-4 inches of vegetable outside the device to hold and maintain a grip on? How do you turn it? Seems to me like you will only get to use half of any vegetable you want to put in there or risk cutting your hand as you try to reach in to turn the vegetable. How do you account for that? The Spirelli does come with a top piece that pushes the last portion of the vegetables into the spirelli slicer so you don't put your fingers into the slicer. Also the larger Spiralfix has a spindle and crank, which leaves very little remaining of vegetable that is sliced and there is no need to turn it by hand. One thing to keep in mind with the Spirelli is that for carrots, the thicker the better. Small skinny carrots that are cracked don't work very well at all. Also English cucumbers work much better than the standard cucumbers. Normal cucumbers are too soft and the seeds are too big and clog the slicer. @Sean I had the exact thought! maybe a knife poked into the veg might help finish it up . bet a carrot might even get stuck in there? guess it just does vegetable halves! The Larger Spiralfix works with halved vegetables (keeping the top and bottom flat is key), but the Spirelli works like a pencil sharpener. So the entire (long tubular) vegetable can be cut. The top piece will that comes with the Spirelli will push it further into the slicer. Does it work with white and/or sweet potatoes? As long as the potato can fit into the opening it can work. I have used the spirelli for a long skinny sweet potato. It worked fine. However, I use the larger spiralfix for potatoes to do hash browns and scalloped potatoes. 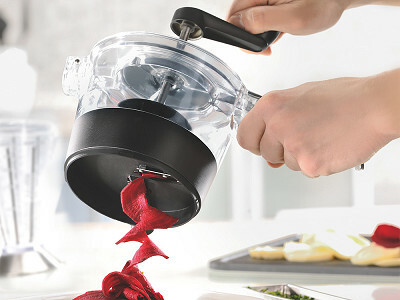 It has an adjustable blade that does 4 different sized cuts and can do any shaped veggie. Quinton I would be EXTREMELY careful using this product with potatoes. It is not well made - the sides come off and the blades are very close to your fingers. 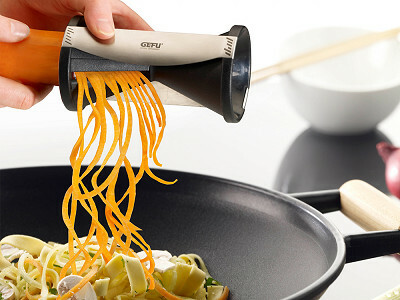 I would suggest the iPerfect Kitchen Tri-Blade Vegetable Spiralizer, Envy Spiral Slicer, Zucchini Spaghetti Pasta Maker. It's a terrific product and can be used with any veggie or fruit. Hope this helps! I had a Spirelli, and returned it. It's frankly a dangerous product. The silver sides fell off repeatedly, almost leading to a serious injury, and I thought I was going to lose a finger trying to clean the blades after using it! The hand cranked version is much more user friendly, and much easier to clean. Hi Gayla, thanks for the feedback. Luckily the Spirelli is dishwasher safe so you can eliminate the risk of hand washing. Did you by chance purchase your Spirelli form Amazon or Ebay? There were some counterfeit products being sold under the GEFU names that were very poor quality. I suspect that this may have been what you had. I have not heard of the stainless steel side handles falling off on our product. You do bring up a good point that the spirelli does have extremely sharp blades in order to slice the product easily and quickly. In fact this is why our product is superior to the other "copies" out there. We recommend that it be cleaned with a kitchen brush and not fingers on or near the blades as with any sharp cutting instrument such as a knife or a mandolin. @Gayla the idea is great, but I agree, the design is seriously flawed. I didn't return mine because I had not saved the receipt. However, it hit the garbage. Very dangerous and doesn't work well. It's a shame, because, like I said, I love the idea. Hi Gayla, it's important to be careful with any product containing sharp blades. The advantage of the Spirelli is that it is handheld and is easily stored. 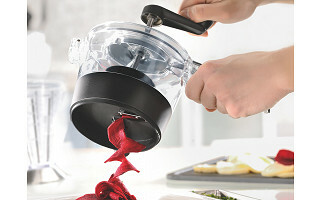 With the top lid for close slicing, you don't have to worry about cutting your fingers even when cleaning as Ron said. Cynthia, it sounds like your product could be a result of what Ron mentioned above. @Cynthia, there is a need to be careful buying products like this on Amazon or Ebay as there is a heavy knock-off risk. At The Grommet we only work with the originator/real deal. Amazon is a "buyer beware" situation as they are not curating the products or lending their reputation to them, like we do. PCH has one of these I had to return it because there's no way to finish shredding what it is you're shredding. Are you supposed to throw away the rest of it? There will be a core left after spiralizing in the Spirelli. Normally this can also be chopped up and added to the dish. The Spiralfix, has very little remaining(about the thickness of a pickle) after spiralizing. I bought a Spirelli about six months ago from Amazon (I am a regular Grommet customer, by the way) and was not at all satisfied with it. I was not able to get the machine to cut zucchini noodles cleanly. More often than not, I'd end up with a combination of zucchini bits and pieces as opposed to the cleanly cut noodles in the illustration above as well as in the video demo. I had even less success with carrots. Unless they were precisely a certain width, the carrots wouldn't slice at all. I can't speak to the effectiveness of the Spiralfix Slicer but one can only hope that it is more efficient than its little cousin, the Spirelli Hand Slicer. And it was the Spirelli by GEFU? Not a copy product? 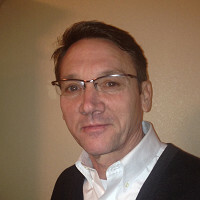 I have been using the Spirelli for several months, what a great product. Makes salads more interesting, and with 7 kids at home, getting them to eat salad is not an easy task. I have seen some knock-offs at discount stores, they may look the same but that is all they have in common. Also, this product has very sharp blades, I rinse it out and put it in the top rack of the dishwasher to clean it without any problems. Thank you Chris, appreciate your comments.